STMicroelectronics has developed new software for creating smart objects that connect using the latest Bluetooth wireless networking features, empowering the next wave of control-by-phone innovation. 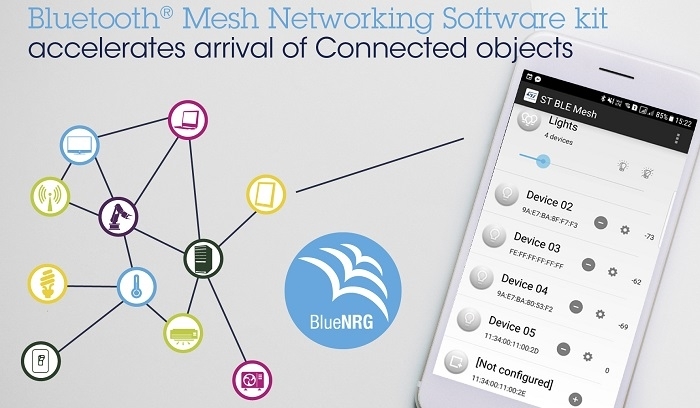 Mesh networking in Bluetooth 5 presents an industry standard that enables OEMs to create interoperable products that provide flexibility and freedom of choice for users. ST’s BlueNRG-MESH Software Development Kit (SDK) enables creation of networked devices and the smartphone apps needed to control them. So far, it is the market’s only three-part SDK that provides two app-developer packages for Android and iOS, and the embedded-development software for building smart objects such as light fittings and sensors. Together, these three packages provide all the software building blocks engineers need to get their applications running using ST’s BlueNRG mesh-ready Bluetooth Low Energy ICs. The BlueNRG-MESH SDK was demonstrated during Bluetooth Asia 2017 in Shenzhen from September 26-27 and is now available to selected customers with the full rollout planned for Q4 2017.